Peers for Progress is building a Global Network of Peer Support Organizations and invites you to join us in this global endeavor. By joining, you help expand this global network. 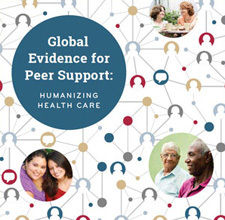 Together, we can demonstrate the value of peer support, extend what we know about its contributions to health promotion and disease management, and promote peer support as a core component of helping people lead healthy lives around the world. Please see Disclaimer: Global Network below. Members of the Global Network of Peer Support Organizations should feel free to refer to their membership within grant proposals, requests for funding, or descriptions of their work in order to document their providing peer support services, exchanging knowledge about such services with others in the Network, etc. However, membership in the Network and participation in its activities shall not be used as a credential or implied endorsement of services offered to those with diabetes or to the public. Also, description of membership and related activities should not be described in a manner that would indicate that Peers for Progress, the University of North Carolina at Chapel Hill, or other organizations affiliated with Peers for Progress endorses the member organization or its programs, grant proposals, or similar requests.